THOSE of us who are growing older can reflect on moments in our lives which are special. They may be happy, sad, proud, or points of change but only a few could be said to be magical. While indulging in a spot of spring-cleaning this week my eye lit upon that special photograph of Emma and myself which appeared in the 2002 Fair programme. If it was a magical time for Emma, it was also magical for me. 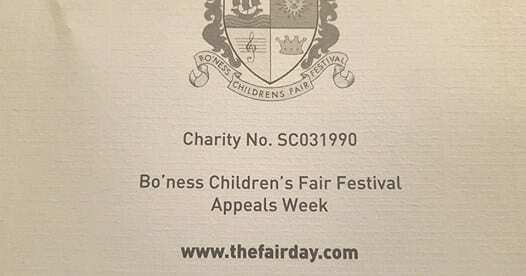 People firth of Bo’ness do not generally appreciate the significance of the Bo’ness Children’s Fair Festival to the Bo’ness people but to one who was born, raised and educated in the town this was a time to be cherished for the rest of my life. My early teaching years were spent in Linlithgow, Grangemouth, Bedford and Dundee. In 1977 I returned to Bo’ness with my family. I have never regretted the years we spent living in other areas but this was a homecoming where faces, friends and traditions were familiar. This was also a time when teaching posts were not as readily available as they had been and I found myself in the ranks of the unemployed for a few months. In December of that year I received a phone call, surely changed days from the Education Office, offering me a permanent position at Bo’ness Public School. This was a particularly convenient post since it was with in easy walking distance of my home. I could not believe my good fortune. After contacting Mr Flint (HT) I began work at P4 in the school where I had received my primary education. I already appreciated that I liked to work with the older pupils and in 1981, opportunities opened up to work in P7. This was a first for two of us in the school. Mrs C. Andrews was the new head teacher at that time and I had my first Primary 7 at Bo’ness Public School. It was also my first experience of being involved with the Bo’ness Children’s Fair Festival which proved to be quite a learning curve for all concerned. Indeed, there were so many firsts that session that it is only on reflection that I wonder we had the energy to complete a successful school year and the Children’s Fair Festival. Perhaps it was all about team work, with teachers, parents and Fair Committee working in partnership. For Lesley Anne, Paula, Keith and the other members of the court it must have been a really special time. After being chosen, there were decisions about what they would be wearing, the house decorations and very importantly, what it would cost. As always there were those friends and parents who were more than willing to raise funds to defray costs. Large amounts of money seemingly appeared overnight. It was a first for me, as a parent, to have my younger son be a member of the retinue although the older two had already performed as presentees. 1982 was the first year that the boys costumes were designed and made to the boys measurements. Gone were the wrinkled tights! The costumes were in a traditional style and made to suit the different tasks which they had to perform. Although I was involved with the design and choice of colours, many others were responsible for the making, fitting and finishing of the garments. Bo’ness has a plethora of fine dressmakers but we were fortunate to have the services of Mrs. Stevenson who measured and sewed and fitted until perfection was achieved. Hats, at exorbitant expense, were bought from Perth milliner who made them from the costume material, or to match. I recall that one granny specifically embroidered school crests which were applied to the tabards. We were justifiably proud of the finished efforts. In 1982, “An English Country Garden” was the choice of theme for the presentees and Bo’ness Public were one of the first school’s to create a large decorated school frontage. Once again I was involved with the design and, in particular the drawing of the butterflies, bees and flowers, cut from polystyrene, which would make up a large part of the frontage. It was decided to involve the children in the painting of the wildlife and a room was set aside for this task. The work progressed for a good few weeks and sometimes we were not so sure about the wisdom of involving the pupils! The children were very enthusiastic however, and could not wait to leave the classroom when they had completed their normal schoolwork. One pupil was so keen that he spent a lot of time in the room and one day he went missing. He was found asleep among the butterflies and bees. It may, or may not, be significant that this same young man now has a PhD in Entymology! Eventually all the work was completed and parents, together with our extraordinary janitor, Walter ford decorated the school in regal fashion. As one who loves flowers and gardening I recall that the presentees’ costumes were particularly attractive. Of course they were in the country garden theme with red and black poppies, daffodils, crocuses, roses and chrysanthemums. They were spectacular in their colour and variety designed and made by Jennifer Cummings who also worked with the children on their dance. But if I have one outstanding memory of 1982 it is that it rained. I, in true Bo’ness fashion, with all my experience of Bo’ness Fair, could never recall such rain, but the retinue moved the Fair Committee to tears with their spirit and sense of enjoyment despite the weather. They sang and laughed their way into the Town Hall. And so the years moved on. I could, if my memory was good enough, continue to write in detail about my subsequent Fair experiences but that is not practical in this situation. There were three others before my final Fair, the court of Queen Gayle in 1987, that of Queen Jennifer in 1992 and the Centenary celebrations in 1997 with Queen Ashley. Each court was unique and beautiful in its own right. Each child giving of his or her best before and during the celebrations. You can imagine with the passing years I became familiar and experienced in most facets of the Fair and it fell to me to take responsibility for the training of the retinue and the preparations for the Kirking ceremony. 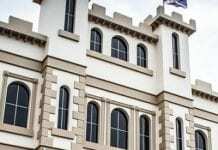 Many people would imagine that what is now an established tradition was always this way, but the Kirking ceremony is one which has evolved over the years. As one who always taught verse speaking and drama and eventually ran the school choir, I enjoyed the work involved with the ceremony and the challenge in finding something different. I don’t say that all the children enjoyed it. Some found it quite daunting to be faced with the largest audience they were ever likely to encounter. I remember one young lady who had to be calmed down before singing the opening solo with the choir. I really thought she was going to refuse to sing and she was so good. Once again we had a young person who went to stage school and spent some years in that line of work. Perhaps she understood eventually that the church was packed with proud parents and others who were there to admire and praise. The Millennium was a point of change for me when, after 23 years of teaching in Bo’ness Public School. I took a position at Bo’ness Academy which would see me into retirement. The post was that of a Primary schoolteacher working in a secondary to improve Primary Secondary links and share Primary teaching methods with staff. I also continued to work with all of the Primary 7 feeder classes and considered myself to be privileged to enjoy the support of all the Primary staff at Bo’ness Academy. To say this work was a challenge is an understatement but I enjoyed the challenge so much that they kept me for another year. The second year of this secondment took me into 2002 and that year it was Bo’ness Public School who would have the Queen and Retinue. It was built into my contract that I would have release from my duties in Bo’ness Academy to support Bo’ness Public School in whatever way I could. The initial meetings were mostly held at the end of the school day or after school hours. 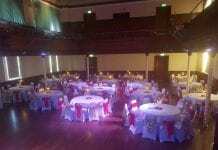 There I was in the thick of it again, helping to chose a theme, with a view to a school frontage, boys and girls retinue costumes and presentees. This is quite a tall order for any school particularly when it is necessary to be novel and innovative. But the ideas and initial plans were there long before any children were chosen to represent the school. That day in February came round and I was there when Emma Docherty and her court were chosen. The excitement and anticipation were tangible but I was somewhat saddened since I knew this would be my last experience of the election of a Fair Queen. After a celebratory drink they left and I don’t think I had much sleep that night. What would I wear? Where would I shop? What would I do with my hair and the obligatory large hat? My friends and I, young and old, had such fun during the subsequent months, planning every last detail and appointment with minute accuracy. 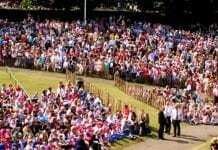 I was quite overwhelmed with the support and good wishes from the Bo’ness townspeople. 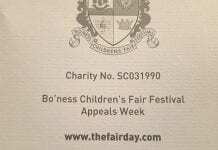 The planning meetings with Art teacher, dressmaker, parents and those for training of the children for Fair Day and Kirking ceremony continued in Bo’ness Public and I played my part. When we arrived at that spot in the crowning ceremony when the Lady who crowns the Queen steps on to the platform I have to admit I had a mild feeling of disbelief. I could not believe after all these years of training the children, that I was to perform the crowning ceremony. The day dawned, fair but a little windy, and I dressed in my finery helped by a friend who has specially come to visit from Canada. I was heralded by Bathgate Band and I knew then it was not only Emma’s special day but also mine. It would be my last as a teacher. What a spectacular way to end a teaching career spanning over thirty years! No one could have wished for a happier experience or a more rousing farewell. I enjoyed every minute of the day perhaps the second when I crowned Emma and looked down on the crowds beneath, was one magical moment which I will never forget. Almost five years have passed since then and the honour has travelled full circle to another fortunate lady. This year Alexandra Findlayson is crowned queen by Eunice Hannah I will be in attendance from a different vantage point and I will watch with pride, not only when three of my grandchildren perform as presentees, but also as Bo’ness Public School pupils perform their tasks, taking pride in themselves and their school and their “best day of the year” – the Bo’ness Children’s Fair Festival. Previous article2006 – Are You Going To The Fair?